Based on the activated sludge process, the Zeo-Clear produces excellent effluent quality. Zeo-Clear systems integrate secondary and tertiary wastewater treatment together in one stage with natural zeolite rock. The microporous structure of zeolite fosters the growth of a microbial population while creating microscopic anoxic zones which helps with nutrient removal. Treated effluents are typically of high enough quality to discharge to percolation fields. An extra level of filtration can be added to treat the water to levels suitable for in-home reuse or discharge to surface waterways. The Zeo-Clear is completely pre-fabricated, pre-wired, and pre-plumbed. This makes installation as easy as supplying power and water. The plug-and-play Zeo-Clear system removes the need for costly infrastructure and saves time in making remote worksites, communities, camps and resorts operational. 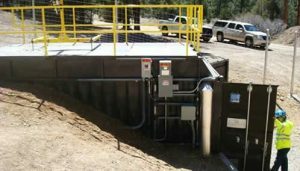 Zeo-Clear Systems can be installed and brought on-line in a fraction of the time it would take to build a dedicated wastewater treatment facility at a remote worksite. 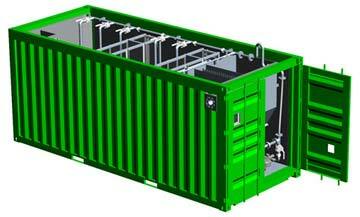 The self-contained unit also provides a significant savings in capital and operation expenses. The Zeo-Clear delivers an average reduction in energy costs of 20 percent. With the Zeo-Clear solution, we empower companies to move quickly into new regions and maintain a competitive advantage. The Zeo-Clear system is completely off-the-grid, self-sustainable and portable, making the most remote locations in the world feasible places to do business. For over 10 years Ecologix has been designing, developing, fabricating, installing and optimizing a range of Dissolved Air Floatation (DAF) systems to fit our clients’ needs. In spite of our success, we have been relentless in the pursuit of improving our own systems and reducing our clients’ operation costs, maintenance, downtime and the elimination of odors and hazardous fumes. The culmination of these efforts is the ACE system.